Omapere Rangihamama Trust farm near Kaikohe in the Far North has won the prestigious Ahuwhenua Trophy BNZ Māori Excellence in Farming Award for the top sheep and beef farm in Aotearoa New Zealand. The announcement was made by the Right Honourable Bill English at an awards evening attended by more than 700 people in Whangarei last night. The function is regarded as the premier event on the national calendar for NZ agribusiness. It was attended by Māori leaders, politicians, agribusiness professionals, whānau of the finalists, past winners and media. The trophy along with a special medal and a replica trophy was presented to the Chairman of the Trust Raniera (Sonny) Tau. The Trust also received more than $40,000 in prizes. The other two finalists were RA and JG King Partnership of Puketawa Station near Eketahuna and Pukepoto Farm Trust at Ongarue near Taumarunui. Omapere is a 902 hectare (effective) mixed sheep and beef property which is in the process of transitioning into a mainly bull beef rearing operation. The farm borders Lake Omapere and since 2007, the present trustees of the property have embarked on an extensive strategic plan to improve the farm. The judges who selected Omapere as one of the three finalists in the competition noted many positives including the clear strategy of the Trust, its contribution to education and its overall farm performance. The Ahuwhenua Trophy Management Committee Chairman Kingi Smiler congratulated Omapere Rangihamama Trust saying like all Māori farms, it has a strong strategic and practical commitment to improving the environment of the property and this is benefiting their whānau and all other people in the district. He says Omapere is also doing a lot to encourage its young people to make a career in agribusiness by offering scholarships and this again highlights their intergenerational strategic thinking. Kingi says those who attended Omapere’s field day would have come away well informed and could not help but admire the passion and commitment to making the best out of some challenging country. Kingi congratulated all the finalists saying it was great to see three top quality sheep and beef farms selected as finalists for this prestigious trophy. He says all are top performing, extremely well run farms in some of the most challenging country and at a time when the New Zealand primary sector has encountered volatile global markets and low prices together with a need to adapt to climate change. He says the people who run these operations are positive and confident about their future and are taking an approach that Sir Apirana Ngata and Lord Bledisloe who inaugurated the competition would have wished. “New Zealand is fortunate to have Māori farmers because it is in their DNA as kaitiaki to manage the fragile environment and invest for future generations. This spiritual closeness to the land is vital in a modern society where consumers not only want food, they want assurance that it is done sustainably and ethically” he says. Kingi Smiler says Māori agribusiness is in very good shape. He says the Ahuwhenua Trophy has been a major factor in lifting the profile and showcasing Māori agribusinesses contribution to the New Zealand economy. More information is on the Ahuwhenua Trophy website www.ahuwhenuatrophy.maori.nz or contact Peter Burke: 021 224 2184 / peterb@actrix.co.nz. Our thanks to our valued Ahuwhenua Trophy sponsors: BNZ, B+LNZ, Te Puni Kōkiri, Ministry for Primary Industries, Te Tumu Paeroa, AgResearch, Ballance Agri-Nutrients, PGG Wrightson, Primary ITO, AFFCO, Allflex, BDO, Landcorp, Tohu Wine and WorkSafe. A big thanks also to sponsors of the Ahuwhenua Young Māori Farmer Award: Primary ITO, Te Puni Kōkiri, Te Tumu Paeroa and Allflex. The farm run by the Omapere Rangihamama Trust (ORT) is situated just 2km northwest of the Far North township of Kaikohe and is regarded by its shareholders as a taonga tukuiho, gifted to them over time by their ancestors. Up until the 1950s the Omapere land had separate titles occupied by individual/whānau owners who used the land for food gardens and small dairy units. The size of individual lots became uneconomic with some lots starting to show signs of neglect. Under the Māori Affairs Act 1953 these separate titles were amalgamated under one title known as Omapere Taraire E and Rangihamama X3A Ahu Whenua Trust. During this process the Crown (through the Māori Trustee) acquired a substantial holding in the Omapere block due to the conversion and live purchasing of shares. After the amalgamation, it was run as a sheep and beef unit under the management of the Department of Māori Affairs. Under new leadership, from 2007 there has been a determined effort by Trustees and shareholders to purchase the Māori Trustee shares back. ORT now owns 54.86% of the shares and there is an ongoing strategy to continue purchasing shares until it is fully owned by them. In the past the farm ran a combination of sheep and beef. The planned move away from sheep to beef has largely been driven by better returns for bull beef and poorer returns for wool, sheep and lamb. The farm is mainly undulating country with some flats making it ideal as a finishing farm. The bulls are bought in as rising one year olds and then sold on as two year olds. The stock are only grass fed. A manager and three staff run the farm and they report to a farm committee comprising of a consultant, a shareholder, the Trust’s accountant and a Trustee chosen for their specialist farm knowledge, skills and attributes. A unique feature of the Omapere Farm is that the farm borders the only Māori owned lake in Aotearoa – Lake Omapere. This is considered a sacred site and a taonga tūpuna in its own right. On the property is also Putahi maunga, one of the pou of the house of Ngāpuhi. This maunga also holds the oldest Ngāpuhi burial caves where only Ngāpuhi chiefs are interred. Their protection is absolutely paramount and the Trust is one of those responsible for this duty of care. The Trust has identified other sacred burial sites, wāhi tapu and sites of significance on the property. ORT has ensured that these areas have all been fenced off and in some cases vested as Ngā Whenua Rāhui. Care of the environment is a major foundation for the ORT strategy and the Trust takes this and the reduction of our environmental footprint very seriously. ORT prides itself on being ahead of legislative requirements in this kaupapa. As an example, the fencing of a significant buffer zone bordering Lake Omapere was commenced in 2001, long before legislation requirements were enacted. The fencing of Putahi maunga, has been in place for many years. ORT also maintains strong links with their shareholders by holding six monthly special meetings and a full AGM in October at which Governance reports on the quadruple bottom line of environmental, social, cultural and economic outcomes achieved and not achieved over any given reporting period. Approval is also sought for any major changes to farm policy. ORT is a great model of whānau working collaboratively to gain the maximum return from their land but at the same time placing equal emphasis on preserving this taonga for future generations. 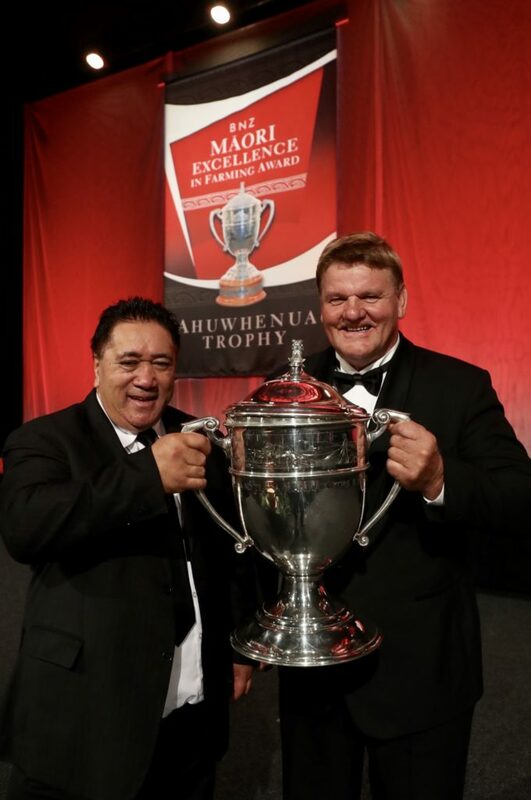 The Ahuwhenua Trophy is the most prestigious award for Māori agriculture. It is now 84 years since the visionary Māori leader Sir Apirana Ngata and the Governor General at the time Lord Bledisloe launched this award. Since the re-launch of the competition fourteen years ago Māori agribusiness is now seen as an integral part of the New Zealand economy. In 1936, the cup was won by Henry Dewes, a sheep farmer from Tikitiki. The Trophy was displayed in the Waiapu Farmers store which two weeks later caught fire and destroyed the cup. It was replaced with a new cup in 1938 but six years later that trophy was lost during a rail trip from Rotorua to Wellington. It was eventually found in 1946 in a Frankton store after being mislaid with someone’s personal belongings at the railway station. A new award for young Māori farmers was introduced in 2012. The first winner of the Ahuwhenua Young Māori Farmer Award was Tangaroa Walker. The 2015 Sheep and Beef Award was won by Hannah Wallace. A special book, ‘Ahuwhenua – Celebrating 80 years of Māori Farming’ was launched by the then Minister of Māori Affairs, Hon Dr Pita Sharples in 2013. It was written by the eminent historian Dr Danny Keenan and traces the history of the Award and gives a quite brilliant insight into the development of Māori farming over 80 years. This book shows just how much Māori farming has developed over the years and how the Ahuwhenua Trophy has established a strong platform for the future growth.